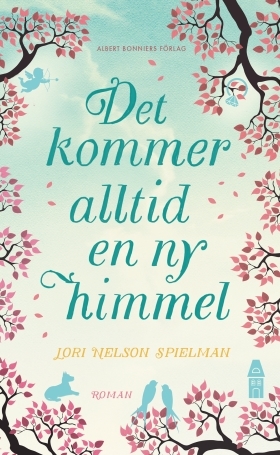 I Lori Nelson Spielmans relationsroman Det kommer alltid en ny himmel så är det en dotter och hennes mamma som står i centrum av berättelsen. Redan på de första sidorna av boken så förstår jag som läser att modern just dött och kvar på hennes lavendeldoftande lakan ligger dottern Brett. Begravningslunchen pågår för fullt i nedervåningen av mammans mysiga hus i den välbärgade delen av Chicago och allt Brett kan komma på att göra är att öppna den exklusiva champagnen som hon och mamman köpt tillsammans för att fira den dagen då modern är frisk igen. Brett är precis den välartade dotter som alla förväntar sig, hon arbetar i mammans kosmetikimperium och är nu på tur att ta över. När testamentet öppnas har mamman förberett en rejäl överraskning för Brett, VD-posten går till svägerskan och där ligger en lista som Brett skrev när hon var 14. Bara om hon ser till att uppfylla sina livsmål på den så kommer hon att få tillgång till sitt arv. Which three words would you choose to introduce yourself by? Today is Mother’s Day in Sweden and your novel is a story about a mother and a daughter, why did you choose to write about such a relationship? Perhaps because I have a close relationship with my mother, or perhaps because I always wanted a daughter, but for whatever reason, I seem to gravitate toward mother-daughter relationships in my books. That motherly bond is something so intrinsic, so basic and vital to us, as humans. But the mother-daughter relationship is often complex, and can be wrought with conflict. A mother’s role is to nurture, but also to guide and, ultimately, to let go. It gets tricky when one of these roles is off-balance. Expectations and hopes can be crippling when the mother’s goals don’t match the daughter’s. And this makes good fodder for storytelling! In the novel Elizabeth, the mother, dies and leaves Brett with a challenge. She is to fulfill the list of wishes she had when she was fourteen. For me such a challenge would be impossible, what about you? What kind of dreams did you have when you were fourteen? Was writing books one? The novel was actually inspired by the life list I had written when I was somewhere between the ages of twelve and fourteen. I found the crumpled list over twenty years later, when I was cleaning out a closet. It was strange, looking at that list of twenty-seven goals I once dreamed of achieving. I wanted a horse and a dog and lots of children—none of which I had. It made me wonder, do our dreams evolve as we age, or do we give up and settle. Would I have been happier, had I accomplished every goal on that list? Many of my adolescent dreams were silly, like Have boyfriends, Be a cheerleader, and Have lots of clothes. Others were more thoughtful, like Have a close family, Help people, Give my body to science. I used most of my own goals when writing The Life List. I wish I could say writing a novel was on my list, but like Brett’s goals, mine were very humble. As a child and teen, the idea of becoming a writer never once occurred to me. In my middleclass neighborhood in my middleclass town, I’d never met a single novelist. I like to think that the young girl I once was would be smiling, giving me a thumb’s up, pleased that I took a chance on something she never dared to dream. I sometimes get quite annoyed with the mother of the novel, she kind of tells her daughter that she knows best, even after her death. Isn’t that a little late and do mothers always know best? I understand, Anna! More than one reader has told me that they resented Elizabeth for leaving a stipulation for Brett’s inheritance. But I promise you, Elizabeth’s heart was pure. As she neared the end of her life, it pained her to see how lonely her daughter had become, and how Brett’s true dreams were slipping away. A large inheritance would have enabled Brett to continue her passionless life. (And let’s face it, Brett’s boyfriend would have spent all the money, anyway!) As her last gift to her daughter, Elizabeth took a chance at changing the trajectory of Brett’s life. She forced Brett to reach deeper, to find the things that truly mattered—a fulfilling career, a family, true friendships, a home—knowing these were the things that would bring Brett true fulfillment. I don’t believe mothers always know best, but I do believe some mothers have an uncanny instinct, and might know their children better than they know themselves. Elizabeth was this kind of mother, and I think most readers come to appreciate Elizabeth’s wisdom as the novel progresses. Today we have a long list of books, films, TV-series and music on our blogsite with interesting portraits of mothers. What would you like to add to such a list? One of my favorite songs is “I Hope You Dance” by Lee Ann Womack. It’s a mother giving her child advice, hoping they will fall in love, stay hopeful, give faith a chance, and never settle. Whenever I hear it I get choked up. The movie The Sound of Music depicts a nun who becomes a nanny, who becomes a stepmother. Maria exhibits such wisdom, and she respects the children as individuals. To me, Maria is the perfect combination of nurturer, friend, and advisor. Another mother I love is Marilla Cuthbert, the formidable mother figure from the Anne of Green Gables books. Though she was expecting a boy orphan to help take care of the farm, she grew to love the spunky Anne Shirley, and showed her love in quiet, comforting ways. The movie Stepmom is a great example of two mothers—one who’s suffering from Cancer, the other who is a stepmom—who put aside their differences for the good of their children. One of the most complicated mother-daughter relationships in film is the movie, Terms of Endearment. Shirley McClaine’s character Aurora is self-absorbed and critical of her daughter Emma, played by Debra Winger. But when Emma becomes ill and her marriage crumbles, Aurora rises to the challenge, welcoming her daughter and grandchildren into her home. She is finally able to demonstrate her true compassion for her daughter and her grieving grandchildren.